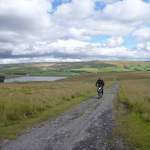 Set in the stunning location of England's Last Wilderness, the North Pennines, and an Area of Outstanding Natural Beauty. The newly renovated bunkhouse, sleeps 20-24 in 3 rooms, the largest bunkroom also has its own en-suite. All bedding is included and towels can be provided at an extra cost. With a lounge, fully equipped self-catering kitchen, modern shower room and large conservatory for chilling out under the stars, it has everything you could require! Perfect for either a weekend break or a longer stay to explore this 'Great Outdoors'. Both solo travellers and groups are welcomed. The adjoining campsite sits in part of a 4.5 acre wildflower meadow with terraced pitches to enhance the infinite view of this valley. There are also electric hookups in the car park for motorhomes and caravans. Ideally placed for exploring Cumbria, Northumberland and County Durham. Not far from the famous Hartside Pass, this beautiful local area is great for getting out and exploring both on and off road and within 2km of The Miners Arms and Nenthall, both of which serve food. A previous guest said “The hospitality, scenery, campsite and amenities, the food, drinks, good music and the people were simply first class.” Whether you want to get away from it all on your own and explore the natural world, or get together with a group of friends, there's everything you need to create some great memories! An 18th Century Mill in the village of Great Ormside, a short ride from Appleby in Westmorland. The mill has a comfortable living room with low beams and a log burning stove, dining room, fully-equipped kitchen, 7 bedrooms with 19 beds (linen provided), 3 toilets and shower rooms. The centre sits in its own wooded grounds next to Helm Beck, with a large grass paddock, small orchard, paved courtyard, barbecue area and fire pit. A large lockable barn is ideal for motorbike storage, outdoor tap and hose for cleaning and 4 additional showers and toilets in the barn. 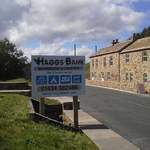 Ideally located for visits to Hadrian's Wall, High Force Waterfall, Barnard Castle, Penrith and many beautiful and historic sites and villages of the Lake District and the North Yorkshire Moors National Park. Free Wi-Fi. Drying room and Motorcycle washing facilities. Garaged and private parking.